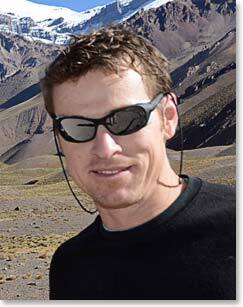 Hola, this is Todd Pendleton calling from the top of Aconcagua. 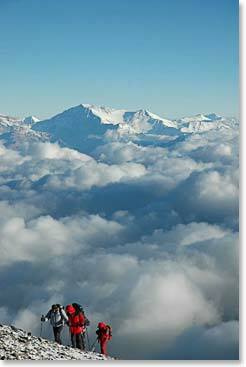 We just made it to the top at nearly 7000m (22,841ft/6962m). Basically I couldn’t have done it without Osvaldo, Simon and Sergio. I was touched by the sacrifices they made to get me up here and it is truly a credit to them. I never could have done it by myself. So we just got up here and there are limited clouds. 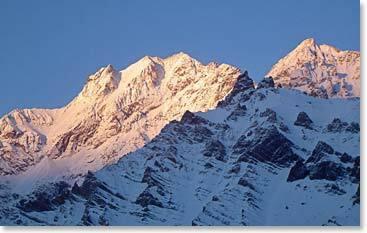 It is a perfect day with sunshine all day and the snow lit up by the moonlight last night—pretty much a perfect climb. I wish Maggie and Stuart could be here to celebrate this with us. They will be off to climb many more mountains in the future, I imagine. I want to thank Berg Adventures for inviting me to come along on this expedition and for creating such a great crew. That’s all I have to say for now. I’m pretty much exhausted. This is a giant colossus of rock. I didn’t think we were ever going to get to the top. I was just running on emotions for the last couple of days and I didn’t want to let you guys down. This is truly a test of patience, perseverance and pain—to put it mildly. It’s time to go down the hill and get a cerveza. Thanks all and we will talk to you soon. Adios.